The March WER report recalibrates the 2016/20 forecast of production floater orders made last October. The orders forecast is reduced 12% based on the deterioration in market conditions over the past six months. Oil prices have fallen more than anticipated, upstream investment spending has been significantly cutback, short cycle upstream projects have risen in priority, Petrobras continues to decline and FLNG projects have had several setbacks. But we still see more than 80 production floater contracts over the next five years. Backing up the revised forecast is an up-to-date listing of the projects we see leading to a production floater contract (1) over the next 18 months, (2) within the next 18 to 36 months and (3) 36 to 60 months out. 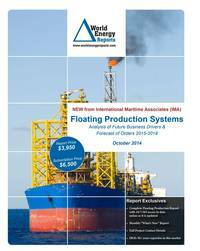 In the data section of the report are details for 242 floater projects in the planning stage, 62 production or storage floaters now on order, 280 floating production units currently in service and 30 production floaters available for redeployment contracts. Charts in the report update the location where floating production and storage systems are being planned, operating, being built and to be installed. Accompanying excel spreadsheets provide the report data in sortable format. Information is current as of 21 March.